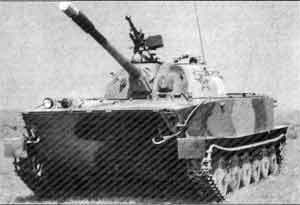 After the development of the Type 60, a clone of the Soviet PT-76, was unsuccessful the Type 63 with various improvements was developed in the late 1950s. It was based on the hull design of the Soviet PT-76 fitted with a turret from the Type 62 light tank, a more powerful 85 mm gun, a 7.62mm coaxial MG, a 12.7 mm AAMG, improved armour protection and a 12-cylinder 400hp engine. The result was a successful design that fought well in the varied terrain of China and southeast Asia. Initial development work on the NORINCO (China North Industries Corporation) Type 63 light amphibious tank was carried out at the Chinese Military Engineering Institute (MEU) and the No 60 Research Institute for the Fifth MMB. Further development and prototype construction was carried out by the Chinese Armoured Force Science and Technology Establishment and the No 615 Factory. Final development was carried out by No 256 Factory and after trials the vehicle was accepted for service as the Type 63 light amphibious tank in 1963. 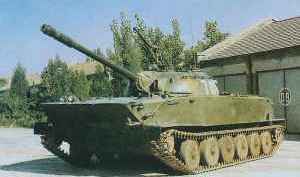 China is known to have received some Russian PT-76 light amphibious tanks which could well have been used in the development phase of the Chinese Type 63 light amphibious tank. From a recognition point of view, the major difference between the Chinese Type 63 light amphibious tank and the Russian PT-76 light amphibious tank is that the former has a different turret of cast rather than welded steel construction. The Type 63 light amphibious tank is heavier than the Russian PT-76 but has a greater road speed and power-to-weight ratio because of its more powerful engine. 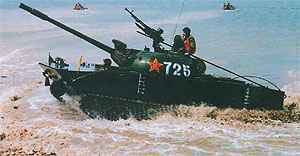 In addition to being used by the Chinese Army the Type 63 is also used by the Chinese marines who come under naval command. 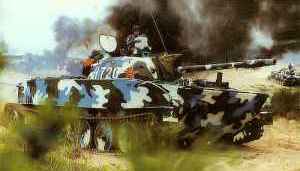 As far as it is known there has been no recent production of the Type 63 light amphibious tank by NORINCO. The hull of the Type 63 is welded rolled steel and divided into three compartments: driver's at the front, fighting in the centre and engine at the rear. The glacis plate of the Type 63 is much shallower than the Type 60 or PT-76. The driver is seated at the front of the hull on the left and is provided with three periscopes forward and a single-piece hatch cover that swings to the left. There is a single infrared driving light on the right side of the hull front. The turret is in cast steel sections welded together, with the commander and gunner seated on the left of the turret and the loader on the right. The commander's hatch opens forward and the loader's to the rear. A dome-shaped ventilator is mounted in the turret roof to the rear of the commander's and gunner's hatches. The engine and transmission are at the rear of the hull and additional fuel tanks can be fitted on top of the hull to increase operational range. The torsion bar suspension consists of six large rubber-tyred roadwheels similar to the Soviet PT-76, with the drive sprocket at the rear and the idler at the front. There are no track-return rollers. Main armament of the Type 63 is an 85 mm rifled gun, probably identical to that installed in the Type 62 light tank, which fires ammunition of the fixed type including APDS (muzzle velocity 792 m/s), HEAT (muzzle velocity 845 m/s) and HE (muzzle velocity between 280 to 320 mm with a maximum recoil length of 330 mm. Maximum rate of fire is 8 rds/min. Maximum range in the direct fire role is quoted as 5,200 m while in the indirect fire role it is 12,900 m.
Some Type 63 light amphibious tanks have been fitted with a Chinese-designed laser range-finder over the rear part of the 85 mm gun. This is identical to that on some Chinese-built Type 59 MBTs. A 7.62 mm machine gun is mounted coaxially to the right of the main armament and a 12.7 mm Type 54 heavy machine gun is mounted at the loader's station for anti-aircraft defence. The Type 54 is the Russian M1938/46 DShKM manufactured in China. 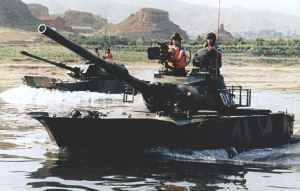 The tank is fully amphibious, being propelled by two water-jets of Russian design. Before entering the water a trim board is erected at the front of the hull; when travelling this folds back onto the glacis plate. As far as is known the Type 63 has no NBC system or night vision equipment for the commander and gunner. Communications equipment installed includes a Type A-220A radio with a maximum range of 16 km and a vehicle intercom set.